(NaturalNews) Even though California's recently passed vaccine mandate, sponsored by sell-out politician Senator Richard Pan, doesn't go until effect until January 1, 2016, schools are already demanding that students be fully vaccinated or else be removed from the classroom permanently. The most disturbing part? It's happening in virtual online schools advertised as providing homeschooling where students complete all of their coursework at home. The only requirement is that they meet with their teacher in person four times a year through testing events, or voluntary school outings. The ultimatum was made when a Sacramento father received a disturbing phone call from his daughter's online school, California Virtual Academies, notifying him that, if his 7th grade daughter does not receive the Tdap (tetanus, pertussis and diphtheria) vaccine, she will be locked out of her online coursework indefinitely. The voicemail, which you can listen to below, states that the student will be denied access to her online schooling until she provides proof of receiving the Tdap vaccine, which the parents are given one week to fulfill. Pattie with California Virtual Academies, who refused to comment when contacted by Natural News, informs the parents that they can fulfill the requirement by taking their daughter to a "doctor or any drug store" to get injected with the whooping cough vaccine, which has been proven to cause brain damage and death in some cases. California's recently passed vaccine mandate, placing it on the 2016 presidential ballot to be voted on. You can donate to the referendum's GoFundMe page, which aims to keep kids in school by stopping SB277. They've already raised more than $100,000 but hope to reach their goal of $750,000. The money will be used to compensate signature gatherers, as well as to counter Big Pharma advertising spending, which is sure to kick into gear once the initiative reaches the 2016 ballot. 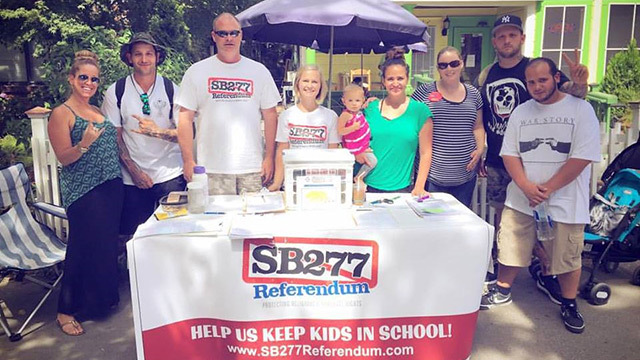 Silva, a SB277 Referendum leader, is responsible for setting up the group's marketing stickers and T-shirts, which are being worn by thousands of volunteers across the state as they actively gather signatures for the petition. Find out where you can sign the petition here. When asked for comment, California Virtual Academy did say a religious belief exemption is available, but as of 2014, the exemption form requires the signature of a healthcare practitioner. Unless SB277 is halted or reversed, beginning next year, students will no longer be allowed the religious belief exemption. While students currently do have the option for exemption, it was not presented to Silva as such; rather, Pattie's voicemail was quite clear: Get the vaccine now or your child can't attend school. "She's concerned about getting behind on her school work," said Silva. Silva's opposition to mandatory vaccination stems partly from his belief that his two children were injured by them when they were vaccinated as toddlers. Both Silva's son and daughter contracted fevers and broke out in rashes the same day after being vaccinated. Silva's son was subsequently diagnosed with Henoch-Schonlein purpura (HSP), an autoimmune disease involving inflammation of small blood vessels that causes the vessels in the skin, intestines, kidneys and joints to start leaking. When asked to sign the SB277 Referendum at a "Congress at Your Corner" event in Lodi, California, although he refused to help his constituents, Republican Jerry McNerney admitted that his son was injured by the pertussis vaccine, or Tdap, the same shot that Silva's 7th grade daughter is being forced to receive – that is if she wants to remain in her online schooling program.